SoftBank may be busy finalizing the details of its rumored T-Mobile takeover, but it evidently still has time to design, build and launch a new kind of robot that it claims can read people’s emotions and communicate in a human-like way. Described by the Japanese phone giant as a world first for its unique capabilities, the bot marks an ambitious new chapter for the company as it sets out to explore an entirely new market. Called Pepper, the diminutive humanoid was unveiled by SoftBank boss Masayoshi Son at a special event near Tokyo on Thursday. “People describe others as being robots because they have no emotions, no heart. For the first time in human history, we’re giving a robot a heart, emotions,” Son told the gathered press. 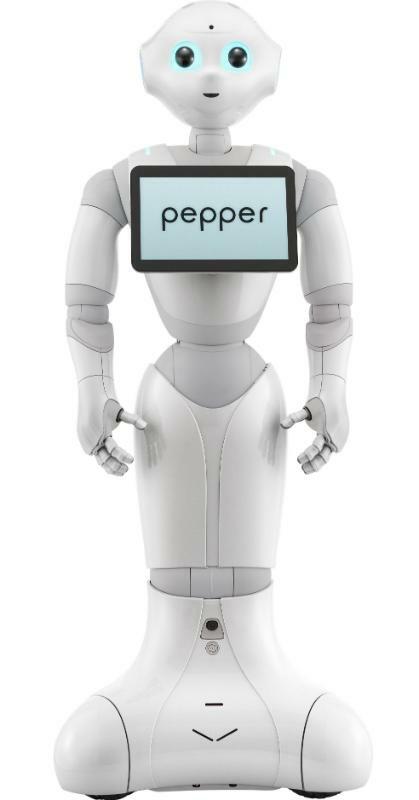 Standing at 120 centimeters, weighing 28 kilograms and featuring what appears to be a tablet strapped to its chest, sensor-laden Pepper uses “emotion engines” to help it understand its interactions with humans, supposedly giving users the ability to communicate with the humanoid in a natural way, “just like they would with friends and family,” SoftBank said. The robot will also connect with the cloud to share data with other Peppers to help it develop its emotional responses. The robot is the result of a collaboration between SoftBank, French robotic specialist Aldebaran, and Japanese firm Yoshimoto Robotics Laboratory. Aldebaran boss Bruno Maisonnier said that in recent years he’s come to believe “the most important role of robots will be as kind and emotional companions to enhance our daily lives, to bring happiness, constantly surprise us, and make people grow.” Indeed, with the country’s fast-expanding aging population presenting a unique set of challenges for Japanese society, it’s possible we might one day find an army of Peppers chewing the fat with the nation’s oldsters somewhere down the line. As SoftBank preps Pepper for a February release in Japan with a 198,000-yen ($1935) price tag, applications will be created by developers in the intervening months to enhance the humanoid’s functionality. In the meantime, you can see Pepper in action at two of SoftBank’s Tokyo stores – in Ginza and Omotesando – where it’s apparently helping to serve customers, a sight surely worth checking out if you happen to be in the Japanese capital.